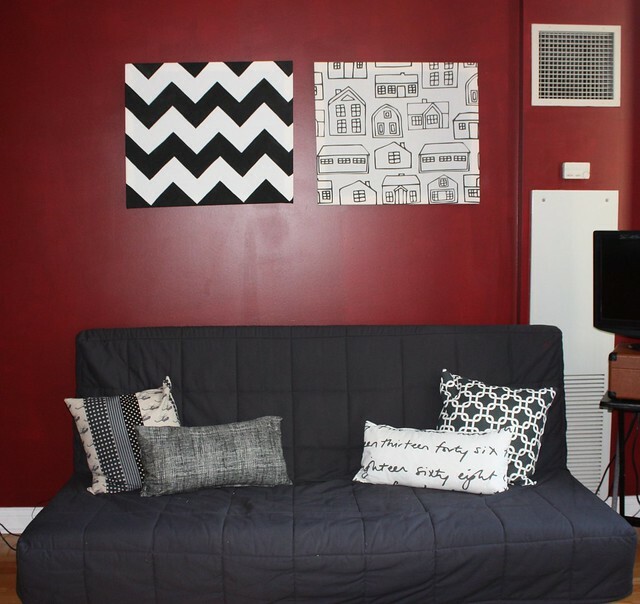 For my apartment renovation, I did (and am still doing) a ton of DIY one projects. For one of those projects, I threw together a few throw pillows for my couch. I’m a big pillow gal (I have like seven of them on my bed) but I wanted the pillows on my couch to be a little more grown-up. I used the throw pillow project as an excuse to check out The Needle Shop. I am SO glad I finally made it over there. It’s a serious hike from my apartment (think 30-40 minutes on the train and about a 15 minute walk) but totally worth it. The store has a ton of beautifully patterned fabrics and a GREAT selection of home decor fabric. I ended up buying two remnant pieces and then a yard each of two fabrics I simply couldn’t leave without. I spent way more money than I wanted to spend but that’s okay. Sometimes you have to indulge a little, right? Anyways, making the throw pillows turned out to be about a hundred times easier than I thought it would be. 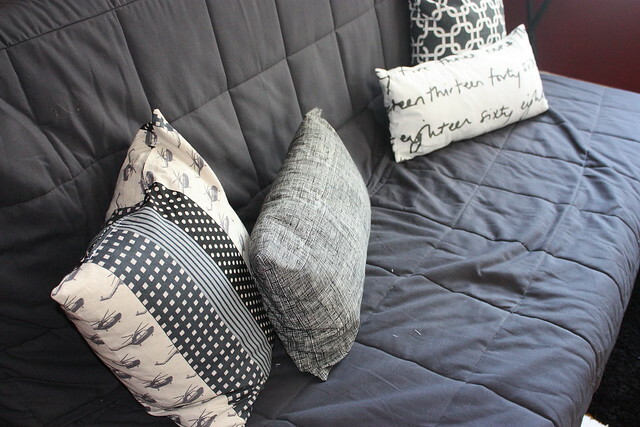 I had purchased two pillow forms from Ikea ($6 each) and my futon came with two pillows so let’s say those were free. My fabric cost about $35 so for four pillows I spent around $50. Considering the cost of pillows, I think I did pretty well! 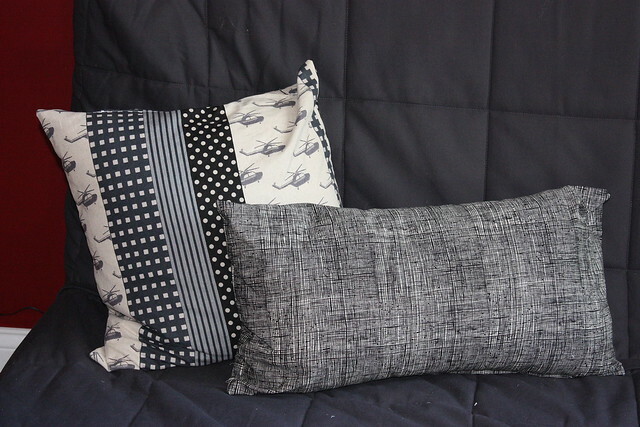 If you wanted to try making some pillow covers of your own, I’d suggest using the following tutorial. By far the easiest method for putting in zippers EVER. This is really just a sneak peek of what I’ve been up to in my apartment. I’ll be back with more apartment photos and DIYs, plus a full tour when everything is in place. As of right now, this area by the couch is one of my favorites in my home. I love all of the different patterns with the black and white! I hope you’re all loving this as much as I am! Oh you're too sweet! That fabric makes me such a happy girl :). Good to know we share a love of Ikea textiles! 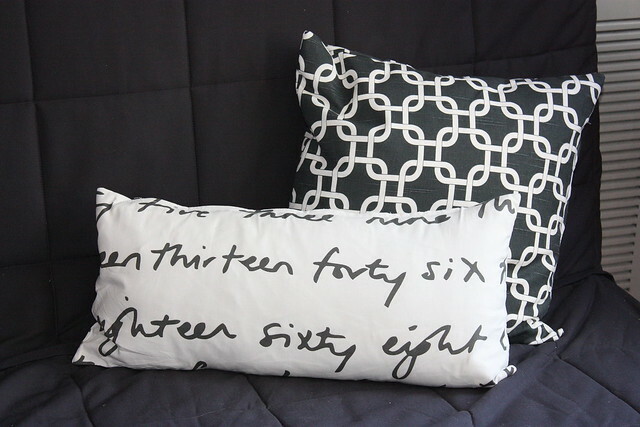 I LOVE your handwriting pillow!